How to: Download a free copy of commencement. 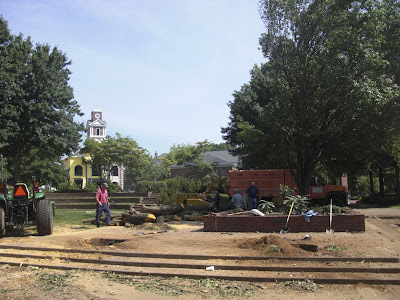 Update: Maintenance states that most of the amphitheater trees (which were planted in 1988) are simply in the process of being replaced. 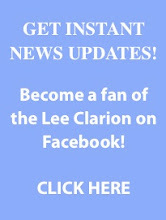 Summer has long been the season of change on Lee University's campus. 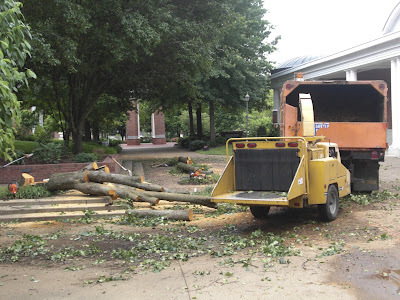 Buildings are normally in a rush to be completed before the fall semester begins, physical plant completes a list of campus maintenance projects, and new faculty emerge as others retire. The latest sign of change? Less trees. 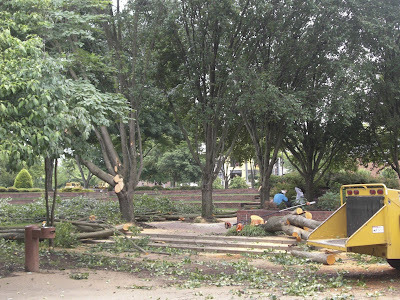 The Beach Building received some pomp and circumstance as it fell, but for the trees lining the campus amphitheater, their demolition receives no such ceremony. Crews came in today to split up the greenery and spew it into sawdust. If I was to venture a guess, I'd suppose that the trees are calling it "timber" after so many years, because they block the majestic sight of the new science tower from those who walk along the pedestrian mall. Imagine the photo opportunities during Lee Day or Homecoming club booth fairs: alumni proudly standing before a tower of triumph. But we've realized that the branches in the winter and the leaves in the summer get in the way. 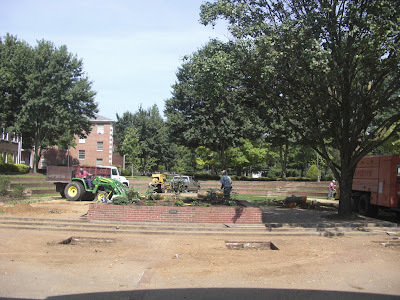 So while we're still waiting for the demolition of the unsightly Hughes Hall to clear the view, we'll go ahead and shear those shade trees that masquerade the building project. So, it looks as if we may be saying goodbye to our prime hammock spots of the past, all in the name of moving forward for the future. In that case, so be it. This is so depressing!! Those trees were gorgeous, especially in the fall! I completely agree that this is depressing. I used to go and sit there and study, read, enjoy friendship, etc. It was a "beautiful" place to enjoy the outdoors. Lee was always said to be a beautiful campus, more than most, but if you take away the trees and such, you are taking the beauty away.